It doesn't take a lot to drag me along for some fun and adventure - I'm very easy that way. Ask me to come and my response is, "...day, time and place?". With this demeanor, I get invited a good number of times to tag along. When I got an invite to 4-wheel drive along a newly discovered dirt road along a narrow ridge, I nearly jumped out of my skin. Whoa! 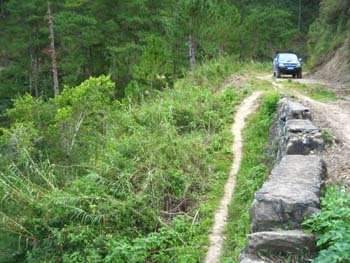 Like Steve tagging me along for white-water rafting, 4-wheel off-roading is new ground for me...never done it, let alone doing it on top of a narrow ridge in the Cordillera. No, I didn't drive...just a lucky non-complaining passenger who's just happy to come along. Phil has been doing the off-road scene for nearly 30 years. 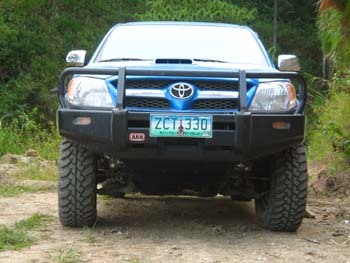 He always brings his luxurious Toyota off-roader as his Cordillera vehicle. As I seek sweet single-track on my mountain bike, so is he about rugged dirt roads for 4x4 driving. He talks the 4x4 talk, using jargon as alien to me as rising-rate suspension is to a goldfish. It's almost brand new. At just a year old, I could still smell the leather. Luxurious on the inside with GPS tracking, it's well armoured on the outside with confidence-inspiring mud grabbers. From 2-wheel drive to 4-wheel, it's got 7 effective speeds. Along with its turbo-charged intercooler, it keeps pulling away no matter how steep the terrain was. 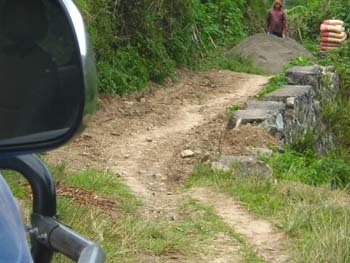 Upon leaving Poblacion, we went down to Sabangan and made a turn into this non-descript road. 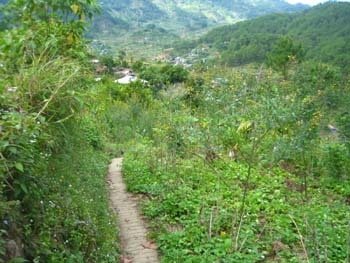 From there, it was an unrelenting steep climb all the way to the top of the ridge. We gained altitude in so short a distance. I was even thinking if it was worth climbing it on a mountain bike. As Phil said, it was the steepest road he's done in the Cordillera...and he rates the Cordillera as the 2nd steepest climbs he's done next to the Himalayas! On the top, it was perhaps a 4 km narrow ridge that left a meter (or 2) of margin before it drastically drops down. The view on either side was spectacular. 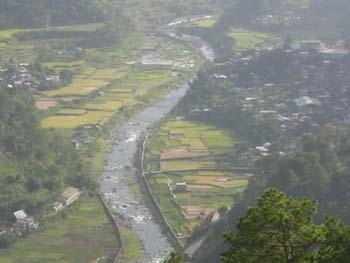 To the left was the town of Bagnen with Mt. Polis on the background. 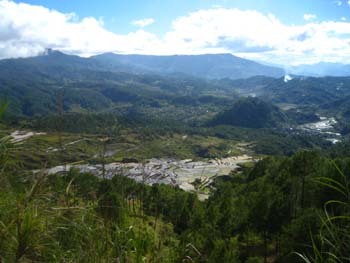 To the right was the highest mountain range in all of the Cordillera...whoa! From the ridge and across the Chico River, we noticed a cell site perched high on another ridge...with a dirt road leading up to it. Phil got excited, "...we gotta get there...we gotta find a way how to get there!". After lunch at a local store in Bagnen, we went out in search for the trail head to the cell site. It wasn't long, after directions from the passing locals, that we found ourselves on the cell trail going higher and higher one more time on tight switchbacks. It was pure fun until we got to the technical section that was narrow with a catastrophic plunge. I got scared. Masking the fear, I asked Phil if he was still within his comfort zone. He said yes although later admitted he was spooked because he couldn't see the road ahead. Nothing gives a rush like doing something totally new. I felt for the first time, the kind of freedom a 4x4 off-roader can offer. It's like mountain biking...but different. I needed that change. While I continue to bike, yoga, cook and hike, it's a variation of the same old thing. In a way, that took me out of a rut. What next? I'm kinda pumped. 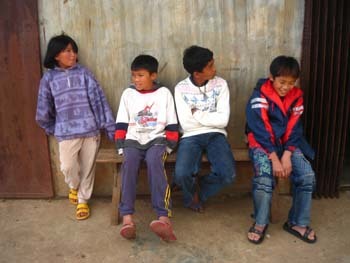 Maybe a visit to the Kalinga region? It's something I haven't done. Perhaps venture into Balbalasan? 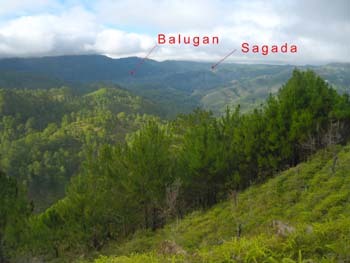 It's a place people say can be the next Sagada. Hmmm....the new year is starting out right. Thanks Phil!